I'm sorry I've been absent! I've not been well and one of the perks to being disabled with bad health is taking time off when needed however I know I have let you down with posts and I'm so sorry. While I was sick I done a DIY on some jewellery box draws I got from the charity shop. I have a few DIY projects so watch this space! The draws were white with child flowers painted on and a horrible fluffy pink handle. I took off the handle and cheap flower knobs and sanded it all down. I then painted it grey with a tester pot from asda! 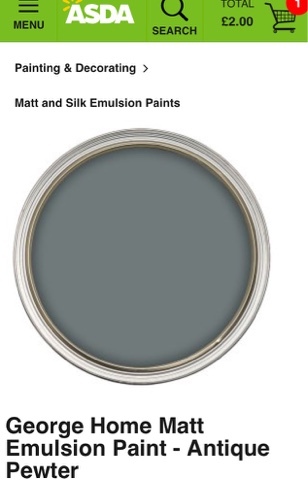 Here is the colour I chose. I bought a £1 sample pot and the draws cost £1 so the cost is at £2 now. Then I glued on some beads from hobbycraft with a hot glue gun. Costing £1. 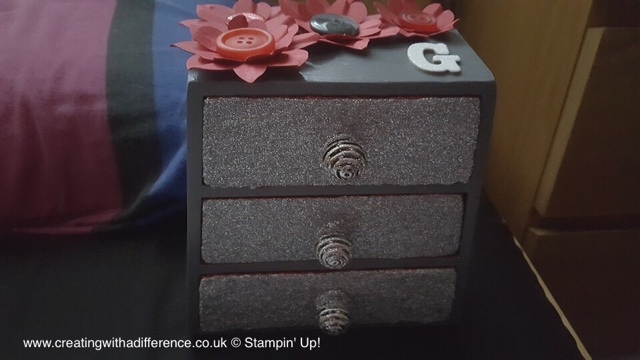 I put silver glitter on the front of the draws with mod podge gloss and sealed with that also. 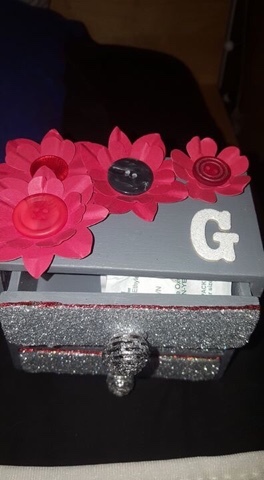 I added red glitter glue to the edges taking the price to £3.50. For the final touches I went over the whole draws with mod podge gloss and punched out some real red flowers using Stampin' up products. I put red buttons in the centre and personalised with her initial. This took the price to £5. That was the best money and time spent. I really encourage you to check out the charity shops, car boots, second hand sites, thrift stores and goodwill! Wherever you are in the world you'll find bargains! Just look hard! I'm on a mission to make all of my presents or do something to them like add a photo to give it that personal loving touch.